Life in media buying is fast paced and chaotic. It’s no mystery why things fall through the cracks when you need to juggle vendor deadlines, synchronize your team’s workload, and ensure that creative, account services, media planners, and media buyers are all on the same page. 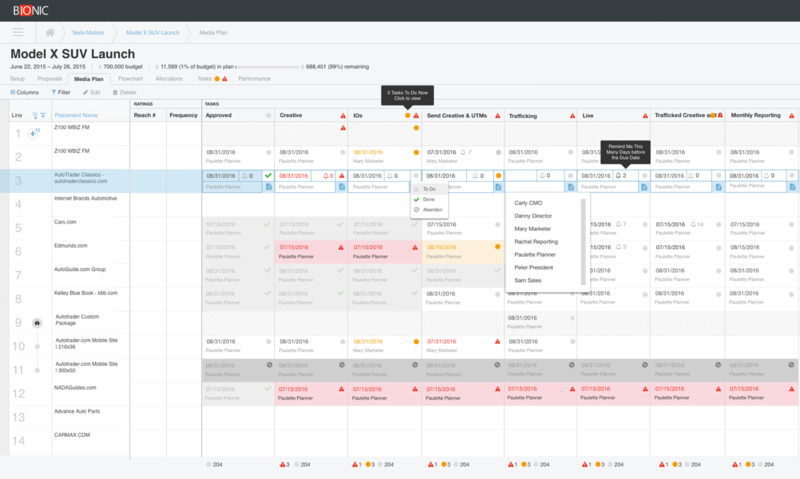 Later this month, Bionic Project Management Software for Media Buying Teams will turn what was once an organizational nightmare into an easy to manage, organic piece of the media planning and buying process. Does the world really need another project management system? There are already hundreds of good project management tools on the market. You may have even tried one or two of them. But none of them have been built specifically for media buying teams. And that’s why they often fail. You need project management software that understands the media buying process and fits seamlessly into your hectic workflow. Bionic Project Management has been developed in partnership with some of the best advertising agencies in the country to create an experience that is designed by media teams for media teams. Task radar, workload management, and collaboration tools will help you tame your tornado of tasks. 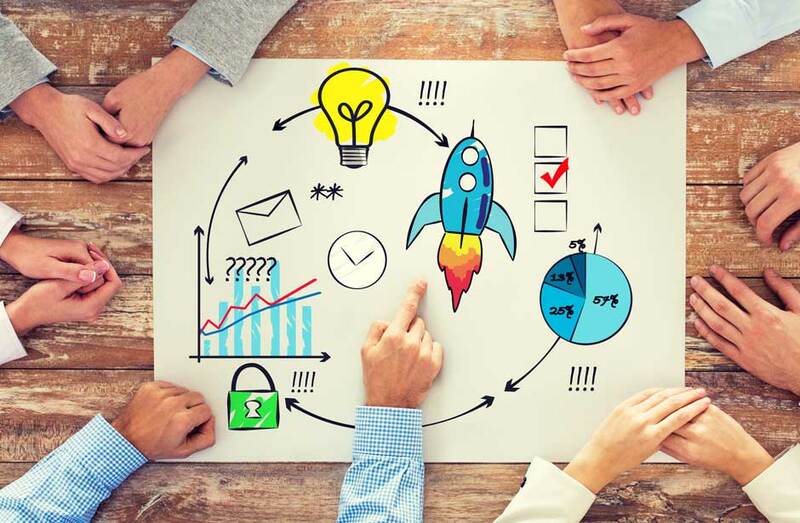 Managing your media projects used to require a minimum of two pieces of software – one for project management and one or more for building the media plan, placing the buy and measuring results. Bionic consolidates all of your efforts into one system. This increases your efficiency by getting rid of multiple logins, cluttered browser windows and the need to switch back and forth between software programs that are unable to communicate with each other. 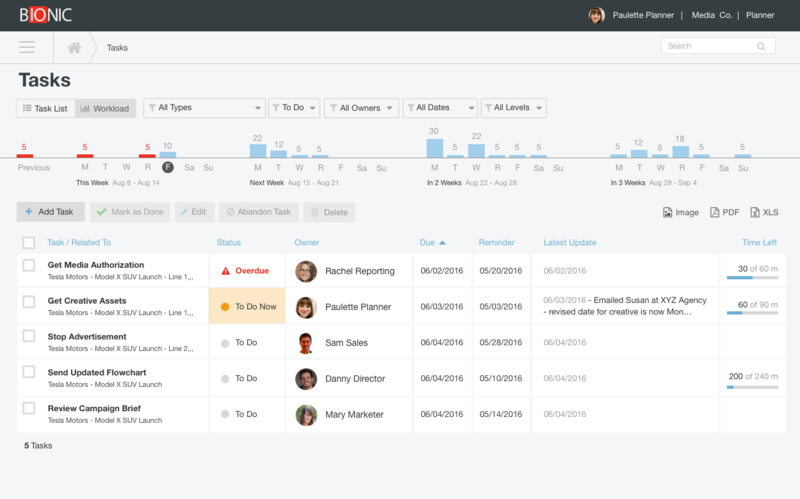 The task page will be your home base for project management. Here you can easily review upcoming deliverables and the latest updates from teammates, all within the Bionic platform. Clicking on individual tasks will open a detailed view that includes a description, completion percentage, and all notes and updates through the life of the task. If you just need a quick overview of what your workload looks like, Task Radar (the upper portion with the blue and red bars) will provide a quantity of upcoming or overdue tasks so you can better manage your weeks. This is customizable based on your filter choices. Directly below Task Radar is an itemized Task List that provides the vital information for each task. This includes the campaign the task is related to, status (Overdue, To Do Now, To Do, Done, Abandoned), who is handling it, due date, latest update, and time left to complete. Tasks in this area are editable, so adjustments can be made on the fly. Get rid of the guesswork when divvying up assignments. 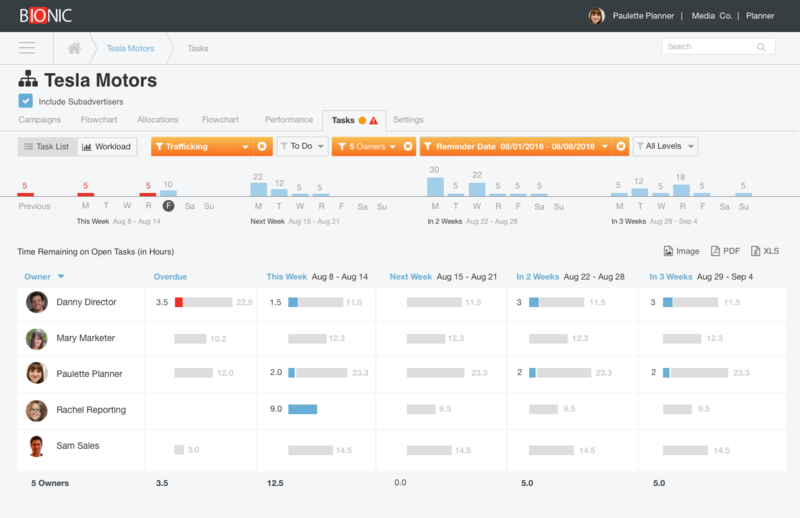 Workload view displays precisely how many hours of tasks each person is dealing with. Media plans are living beasts with constantly evolving timelines. Your team needs to be able to adapt to the changes in order to effectively divide and conquer. This view is invaluable for managers who need to reallocate tasks between team members pinch hitting for someone or during a reorganization of accounts. When you’re blazing through your media plans, having to open and log into a separate program just to check on and update tasks can really throw you out of your groove. Bionic Project Management allows you to view, edit, and add tasks while you’re deep in your media planning and buying. Tasks can be sorted at the campaign level so you can quickly determine who is handling creative, trafficking, insertion orders, and more on each of the campaigns.